From film making to forensics, students from South Gloucestershire secondary schools and academies got a taste of their future employment prospects at a careers event yesterday. Held at the University of the West of England’s Frenchay campus, teenagers had direct access to 120 local and national employers along with staff from colleges and universities who were on hand to help guide the students through their future options. The Ambitions Careers event is organised by South Gloucestershire Council, the University of the West of England and South Gloucestershire & Stroud College (SGS) and has been running for several years. 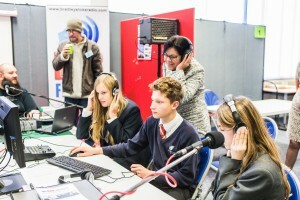 It is one of the largest events of its kind in the South West with more than 10,000 Year 9 students taking part in interactive workshops with employers and thousands more attending the evening events with their parents. Ambitions aims to help young people make effective decisions about their future choices in education and employment.